Combine ground chuck, Asiago cheese, 1 teaspoon of the Fine Sea Salt, pepper and Worcestershire sauce in a large bowl. Form into 6 patties. Grill on closed grill until cooked through (about 4-5 minutes per side). In a medium bowl, whisk together Multiflora Honey, lemon juice and remaining Fine Sea Salt. Add the arugula and toss to coat. Toast the buns lightly on the grill. Divide the mayonnaise between each of the six rolls, spreading on the bottom half of each. 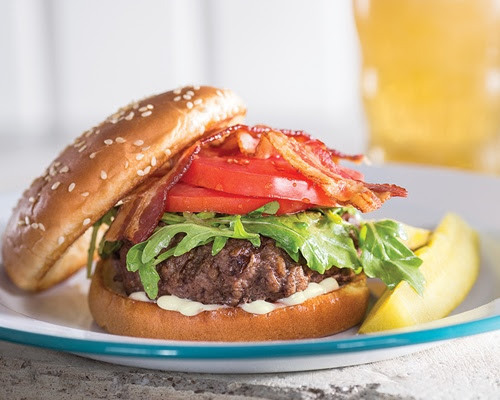 Place patties on buns, add one piece of bacon on top of each burger and top each with a slice of tomato. Evenly divide the honeyed arugula between each patty. Place bun tops on and serve.